« What Blogs Make the Best Podcast Blogs? Validating one web page full of code on your WordPress blog doesn’t help you find all the errors that may be hiding out among all the various pages and page views on your blog. The W3C Canada Validator validates multiple pages on your blog, tracking down errors across the different pages and page views. You can now find errors on your front page, single post page, category pages, and more with one tool. The W3C Multi-Page Validator uses Ajax to generate the list. You have several options for validating your blog. You can index your blog, which instructs the tool to process through the pages but only to count them, not validate them. You can index and validate your blog’s pages, generating a report on the number of pages indexed, the number of pages with errors, number of valid pages, and the number of pages not validated. Scroll down the list of red highlighted pages to find the pages with errors. Click on GO to validate a page or revalidate it. To view the errors on the page, click the number under the “Errors” column and a new page/tab/window will open with a report on errors from the W3 Markup Validation Service, which includes tips and instructions on how to validate most errors. It has a limit of validating 200 pages by folder. I highly recommend that you validate your blog’s design or WordPress Theme after any tweaking or updates. The sooner you can find the errors and clean them up, the better for your blog and its SEO quality control. Because WordPress only uses a few modules to generate every page on your blog, you will find that the majority of your XHTML and CSS errors within the first 20 or so page views. Fix those in your WordPress Theme template files, and it should fix the problems on most pages. 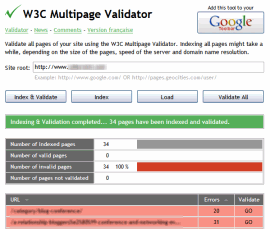 Another interesting feature is the ability to be easily add this multi-page validator to your Google Toolbar. I’d love to see it incorporated into the Web Development Tools Extension for Firefox. This entry was written by Lorelle VanFossen and posted on April 16, 2007 at 5:37 am and filed under blogging tips, Web Browsers, Web Design, WordPress, WordPress Themes, WordPress Tips with tags how to use wordpress, Web Design, wordpress, wordpress help, WordPress Themes, WordPress Tips, wordpress tutorials. Bookmark the permalink. Follow any comments here with the RSS feed for this post. Post a comment or leave a trackback: Trackback URL. Great find Lorelle. This will definitely make my work a lot easier… I normally validate the homepage, pages and posts seperately. Very, very handy! Good find. The most annoying part of validation is having to validate all the various kinds of pages on the site to make sure that there’s no hidden issues. This makes that much simpler. Thanks for the pointer: This tool revealed that a couple of the Spam Karma 2 plugins were generating invalid markup.